Now we all know that Enid Blyton wrote about a lot of animals, in fact almost every story she wrote had an animal of some kind in it. The great thing about her books is that she made every kind of animal accessible for children. Most of the pets I’ll be talking about in this post are unusual pets. Let’s delve right in. How could lovable, “God save the Queen”, “blow your feet”, train whistle Kiki the Parrot, owned by Jack Trent not be at the top of our list? Kiki is one of those animals you want to own, she says all sorts of random things, makes the children laugh, saves them from the bad guys by flying at them or saying random things to startle them. Kiki is also very funny. She’s extremely jealous when Jack pays attention to Philip’s new pets, and she doesn’t always like or tolerate the new animals. She doesn’t take kindly to the monkey Mickey in The Ship of Adventure who is quite happy to play tricks on her, and she doesn’t like Buttons, the fox, in The Castle of Adventure and is quite happy to be horrible to him. Kiki mimics the puffins, Huffin and Puffin in The Sea of Adventure, who also think of her as a sort of strange puffin. Kiki is certainly one of Blyton’s funniest animals because I don’t think I’ve laughed quite so much at fictional animal in my life. She really is a diamond character, perfect comic and strategic timing in places, but sometimes she can be the cause of the trouble. Nevertheless she deserves a spot on Blyton’s funniest animals without a doubt. Pongo isn’t an animal I would expect a lot of you to remember but because Five Go Off in a Caravan is one of my favourite books, Pongo has always been a funny and loved character to me. He does all sorts of funny things like shaking hands with Timmy’s tail and taking tea with the Famous Five and Nobby, as well as copying the things the Five do and following Anne around because she gives him food. He’s a very loyal animal, doing his best to stand up to Lou and Tiger Dan for Nobby and Julian, but he also has his funny moments where you can just imagine him taking tea with the Five and sipping tea out of a little cup. He doesn’t have the longest entry in the world, but I do believe he’s a really funny character. Loony, the black spaniel, lives quite rightly up to his name – he is utterly bonkers. In the Barney Mysteries he gets himself into so much trouble and high jinx. He is what I would think of as a typical dog, fetching everything and putting it somewhere inconvenient. He loves stealing rugs, bathmats, towels, and any sort of brush and making a huge pile on the floor somewhere for ‘his humans’ to fall over. I would say in my limited experience that is typical dog behaviour. He also tears off at top speed all over the place and tries to trip people up. He especially gets himself into trouble when he and Miranda the Monkey get together. They encourage each other and Loony gets ridden like a horse and tears around like no ones business until the daft dog remembers he can roll over onto his back and knock Miranda off. If this doesn’t make Loony one of Blyton’s funniest animals, I don’t know what does! 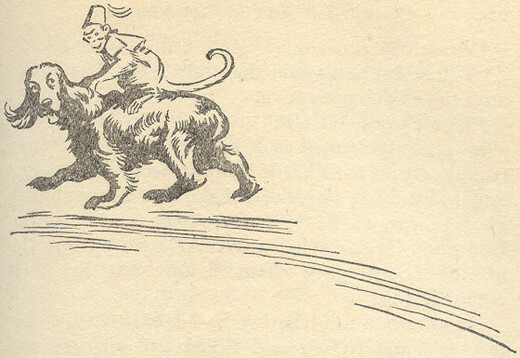 Who do you think are Enid Blyton’s funniest animals? Tell me in the comments below. This entry was posted in Characters and tagged Animals, Five Go Off in a Caravan, Kiki, Loony, Pongo, The Adventure Series, The Barney Mysteries, The Famous Five. Bookmark the permalink. 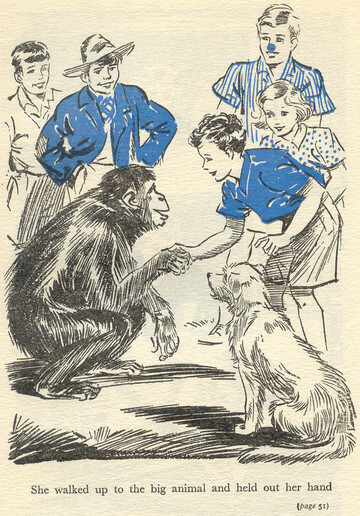 I’m not really a fan of Blyton’s chimps, but I think Looney is very funny, running off with brushes and mats. I like Kiki and Miranda too. Does Clopper count? Clopper certainly counts in my mind!